Visiting each of the Toronto Public Library System’s 100 branches sounds like a daunting task, and this literary scavenger hunt aims to navigate you through each one. Toronto-based graphic designer and web developer Noah Ortmann created the Toronto Library Passport as a way of encouraging local readers to explore each outpost in the city and utilize their free resources. One challenge urges readers to find a book about Roman architecture, while another instructs you to read a mystery novel in the Arthur Conan Doyle Collection—a room in the Toronto Reference Library modeled after Sherlock Holmes’s study. 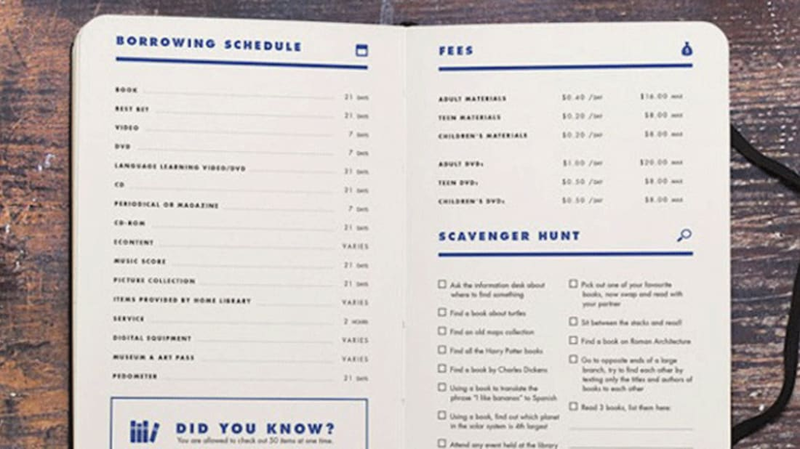 The 36-page booklet also includes branch hours, information about fines, and spaces to jot down your impressions of each location. This isn’t the only new art project that centers around Toronto’s public library system. Daniel Rotsztain, a local illustrator and cartographer, recently drew sketches of all 100 branches and now his pictures are being sold as a coloring book. While neither project was commissioned by the TPL, the artists have received the system's approval. Tote bags branded with Rotsztain’s designs were even handed out at the opening of the library's 100th branch last May. Whether you’re a Toronto resident or just an enthusiastic bibliophile, you can purchase or preorder Rotsztain’s coloring book and Ortmann’s booklet online.